In battlefields on Earth, in space, and on realms known only to imagination, brave men and women answer the call of fate. They leave behind their simple lives and become pilots of giant armed robots, called mecha, opening a world filled with excitement and danger. No matter their beginnings, mecha are tools of war! Pilots will soon learn that with the awesome power of their mecha, comes the awesome responsibility to fight the evil gods of the Living City, put down the Separatist Guard's shameful rebellions, topple unjust kings and his lackies, the Arbor Defense Force, find love with the Cheerleader Captain, and get to class before the Vice Principal finds out. Such is the life of a mecha pilot. No pilot faces these trials alone. 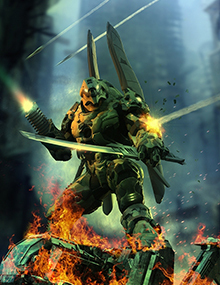 A pilot will always have his mecha to be strong where he is weak and protect him in the face of unspeakable danger. Also, the pilot will always be there for his mecha, who needs to be led to glory on the battlefield. This is mecha-style anime role playing at its finest. Grab some friends, some dice, and this book and get ready to relive the best robot anime you've ever seen and tell mecha anime-stories no one has dreamed of yet. This is Mecha. Any plans for print on demand? How does this game handle out-of-mech combat? If at all? Does the base book handle transforming mecha? If it doesn't, do any of the expansions... and if so: which one? And does it handle transforming mecha well? The base book supports a Configuration called Transformer, but doesn't specifically cover transforming robots. We playtested a Transformers-style game in which every mecha had two Models they could change between. Does that help? It does. Thank you for the quick response. I have started new campaign with other friends... And got questions. 1. Can PC repeatedly get Cut Scenes if he rolls 8+ success again and again? 2. Question about Mecha Mercenaries(I already asked but didn't get answer) : I can't understand why a longer contract is better for players. If they get some logical points in short episodes, isn't it better contract than get same Logical points in longer episodes? Any idea when POD will be available? Great Question The POD will be available within the week. We found an error where one page the art work was printing over top of the text I am awaiting a new proof to arrive before I open the POD back up. I had posted some questions on RPG.NET, but didn't get any response. 1. Do Players accumulate their Overdrive between sessions? 2. If attacker and defender both get a cut scene from their attack and defend roll, how can I resolve it? who get the cut scene first? 3. If players active Analyzer configurations, can they choose "himself" to get 2 additional dice? 4. If players active Hot Shot configurations, can they allocate "temporary" Defense dice (e.g : gained by Jammer configuration or strafing) into Attack? 5. In contested rolls, Can players spend their Overdrive after their opponents roll the dice / or spend their Overdrive? 1. No not as such, Overdrive is earned during the game session only based on the die rolls. Each new session they should reset to the default starting number unless you want to carry over unused Overdrive from previous sessions, since you can play multiple sessions in one sitting. 2. Actions resolve Attacker then defender, in case both get cutscene, Attacker, then Defender then Defender then attacker. Could you explain #2 a bit more? If Attacker and Defender both get cut scene, did you mean it will be resolved like this? 1) Attacker rolls for his first attack. 2) Defender rolls for his first defend. 3) Defender get his cutscene and rolls for additonal move/attack. 4) Attacker get his cutscene and rolls for additonal move/attack. And I would like to ask you some additonal questions. 1) Scanner configuration has different rules in pg.19 and page 28. Which is right? 2) How can I deal with some powerful configuration combo? Some of them are powergamers, and try to find powerful configuration combos as best as they can. The questions which I asked you are all come from my session. One of them they find is Hot shot/ Supercharged Combo. They concentrate thier dice pool to attack and try...See more to get cutscene as many as they can. And if they spend all weapon, they activate Supercharge and using their cutscene to attack again! Yes, think of resolution in the most cinematic way which is exactly as you ordered it. Scanner page 29 has precedence as its the actual configuration. Thank you. This helps a lot!